From the title you might reasonably assume that this is a blog post about chickadees. And you would be right. At least in part. 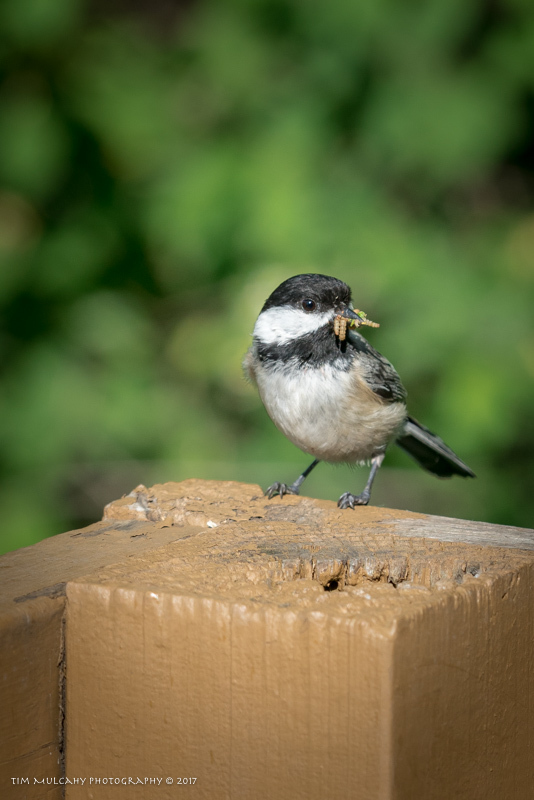 This tale does indeed involve lovable chickadees. However, the 'post' referenced in the title isn't a blog entry, it is an actual 4"x4" wooden post that anchors one corner of our deck. So why does this 'post' share the limelight with nature's little avian harlequins? Let me tell you, Better yet, let me show you. 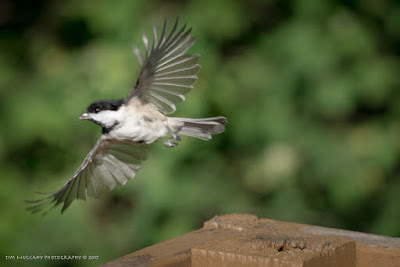 One day while watching TV I noted a couple of chickadees flitting back and forth between a wooden post at the far corner of our deck and branches in neighboring trees and bushes. 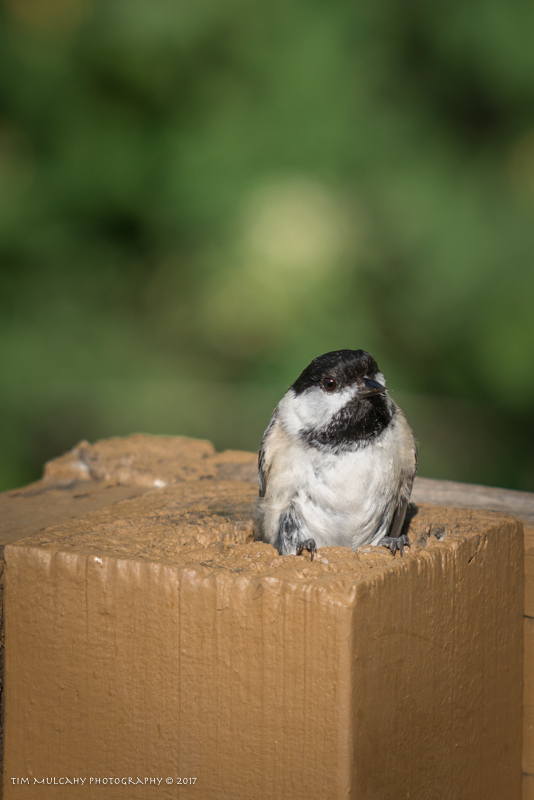 Eventually one landed on the top of the post and then suddenly disappeared - apparently down into the post! 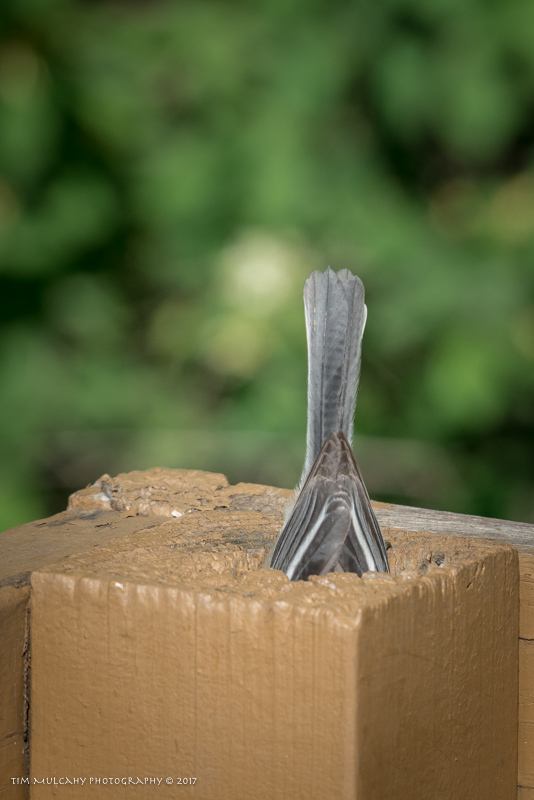 Upon subsequent inspection I discovered that the center of the post had rotted out, creating a cavity roughly 2 inches by 1 inch wide extending deep into the post. 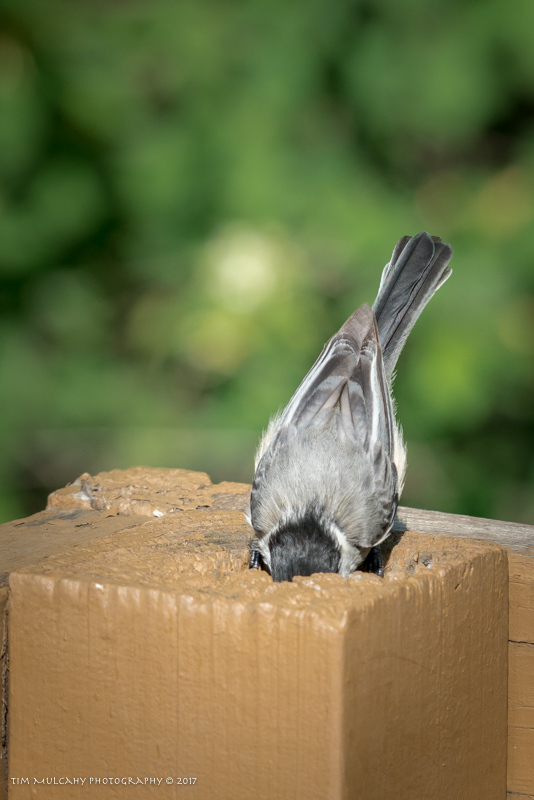 Curious, I watched the activity at the post for the next couple of weeks witnessing the chickadees' repeated disappearance down into the post followed by their re-emergence moments later. 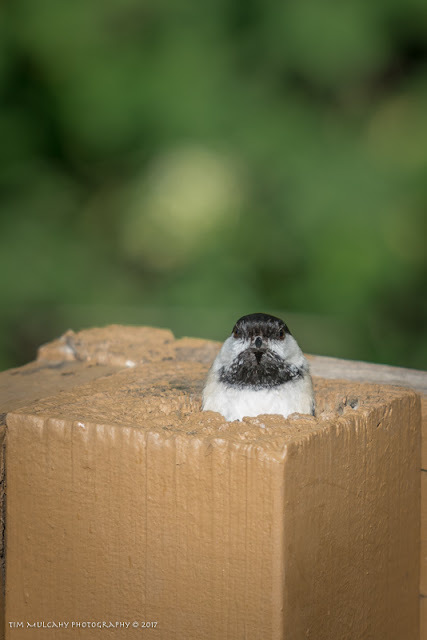 I was eventually convinced they were nesting in the post cavity. However, even with the aid of a light I was unable to see to the bottom of the cavity (which I estimate to be at least 12 inches deep) so could not confirm the existence of nest, eggs or chicks. Confirmation of my suspicion about nesting would have to await stronger behavioral evidence of nesting so I continued to observe the behavior of this pair to harlequins. Lo and behold, one day one of the little birds arrived with a beak full of caterpillar larvae, as in the picture at the top of this post! Momentarily it disappeared down through the hole, popping up to the surface with an empty beak moments later. How they manage to turn around in that narrow shaft just blows my mind! Since then this routine has been repeated - steadily, frenetically - with both partners taking turns popping in and out of their post home to attend to another generation of diminutive harlequins. The following pictures document one such in-and-out cycle. The final shot in the sequence leaves much to be desired from an image quality point of view but I decided to included it since it completes the cycle and imparts a sense of the energy the adults expend in the process. Apologies to my bird photography colleagues who no doubt throw up a little in their mouth when they look at that shot. 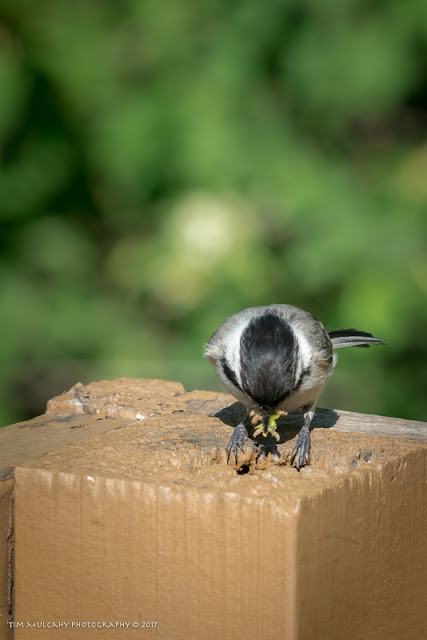 Now I am anxiously awaiting the emergence of the fledglings from 'the chickadee post'. Getting ready for the disappearing act. First one leg then the other. Off to gather the next course.